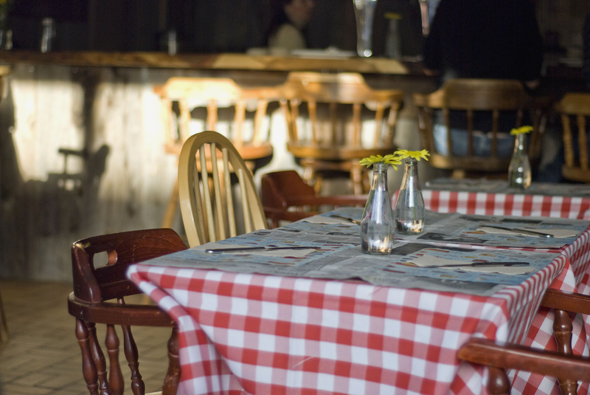 Burger Bar has opened in Kensington Market in the space formerly home to Rice Bar . But this restaurant on North Augusta is more than just a place to fill up on burgers. How about appetizers with a burger theme? Two Cheeseburger Spring Rolls can be had for 5 bucks. Burger Bar opened on October 13th and while many might wait a month or so for them to iron out the kinks, we just couldn't wait and showed up hungry on day number 2. Sure, we expected a few choke ups but since we were paying customers we didn't expect the service to be overly flawed. 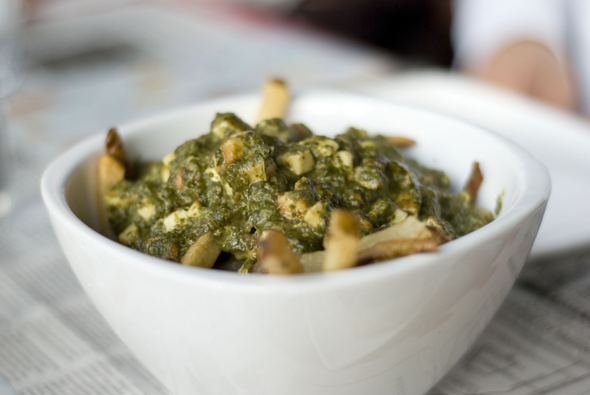 We start with the Saag Poutine, mainly because it just sounded so good, but also because it was recommended by our server. The menu describes the dish as paneer cheese simmered in spices, cream and spinach, served over fries ($9.00). Now, perhaps we should have compared this poutine to the offerings at Smokes or Poutini's but since one of us just returned from a weekend in Montreal it was hard for her not to contrast with the 3am snacks in La Belle Province. As for the rest of us? Well, the fries were crispy and well-seasoned but the topping just didn't do them justice. I love saag paneer (a spinach, mustard leaf and paneer cheese curry dish), but this saag paneer was watery and bland. Service was great at first. Our server made a genuine effort to answer our questions about the menu (albeit with frequent returns to the kitchen), she provided extra plates and helped us to divide our burgers to make it easier to share. But things started to go off the rails once the kitchen made an appearance. We initially ordered the Uni Burger (one topped with sea urchin butter and mustard oil - $10.95). But half an hour after ordering, the waiter informed us they couldn't find the uni butter in the fridge. Hungry but not discouraged, we decided to try the LambBAM ($9.95) instead, a burger that came with kimchi , Danish Blue cheese and Dijon mustard. With influences from so many different countries we should have known the ingredients wouldn't complement each other. Innovative, but no dice. 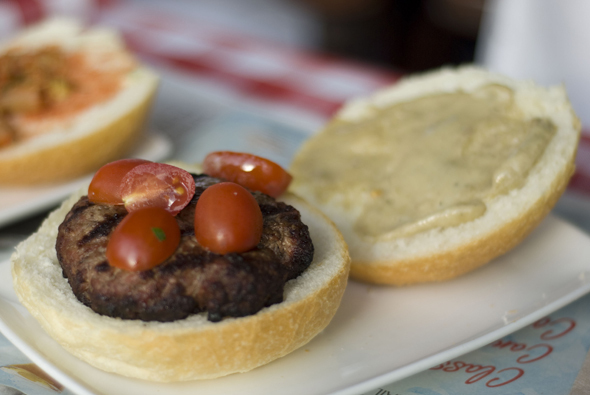 The Aiba burger ($9.95) was served with truffle aioli and grape tomatoes. The truffle aioli tasted earthy and nutty and the grape tomatoes were nice and sweet. Unfortunately, the actual beef patty was dry and devoid of meaty beef flavour. This was extra disappointing because the restaurant itself smells like beef heaven (or, well, hell for the cattle). Vegetarians - you have been warned! The transformation from Rice Bar to the Burger Bar was pretty quick (maybe less than two weeks) and it showed. Although I liked the touches of unfinished wood, the 3D cardboard moose heads on the walls and the exposed filments of their lightbulbs, the space still felt incomplete and non-cohesive. We sat at the only long table by the window. But as it was sunset, this meant that half of us were blinded by the sun (the windows were bare). The final blemish? After we paid the bill our change was "forgotten". Burger Bar might improve over the next few weeks, but personally, I won't be back to find out.